We seek volunteers who are dedicated, open-minded, culturally aware, and passionate about serving others, and who understand how society can be transformed through the education and empowerment of young women. You will either be teaching a group of young women who are on our hospitality training program, or teaching our team the skills we need to help us grow our enterprise and do more work to empower our community. We offer free basic accommodation (bamboo house with outside bathroom) and 2 meals per day. The third may be subsidised. Not included are transportation costs outside of working hours or those unrelated to your volunteer role, additional meals, alcohol, entertainment and any other incidental expenses. However, as we are located by the river in a mountain region, there is little to spend your money on but plenty of opportunities for fun and personal fulfillment in our daily lifestyle and surroundings! What experience or qualifications do you have in the position of interest? We are not currently seeking general help. We are looking for individuals who have a particular skill set - as described in the listing. Thank you. Private bamboo bungalow on lodge property. Facilities are basic. Our staff work from 6:30am to 9:30pm. Helping hours for volunteers take place between these times and may vary depending on your role or project needs. We can arrange airport pickup for you via songtaew (Thai-style covered truck with bench seating). The cost is 700 baht and is divided among the number of passengers if you are sharing the songtaew with other guests. Alternatively, we can help advise you how to take a yellow taxi to the nearest town from the lodge, where we can also arrange for a songtaew to collect you. You can do this in Chiang Mai, if arriving from the city. Having your own scooter or motorbike does allow you greater independence to visit the beautiful local attractions (waterfalls, temples, Royal organic projects, lovely mountain drives) and, as a social enterprise, it also helps us keep our transportation costs down! Scooters can be rented daily, weekly, or monthly in Chiang Mai for around 200-250thb per day or 2-3500 baht per month. PLEASE NOTE: We only recommend that you hire a scooter/motorbike if you are an experienced rider or feel confident enough to do so. Helmets are a must! Any medical, health or travel insurance is at the volunteer's expense. Before confirming any volunteer we may ask to schedule an informal Skype call. Confirmed volunteers will then receive a Volunteer Manual before arrival that includes useful information about the region and guidelines. I spent just one week teaching kung fu to the staff and it was honestly one of the best experiences of my trip thus far. There’s such a familial atmosphere at Chai Lai that makes it hard to leave! All the girls are so friendly and eager to learn, and Alexa and Fran are so inspirational and great to learn from. I look forward to returning soon! I just left this workaway about a week ago after spending nearly a month here! This was without a doubt, one of the best experiences I've had in my 9 months in Thailand. I was teaching English to the staff twice a day (usually for about an hour to an hour and a half a session). The girls were so kind, friendly and eager to learn - which made it… read more that much more fun! The founder of the non-profit and manager of Chai Lai, Alexa is so kind and generous, and invited me to every event taking place at Chai Lai or nearby. 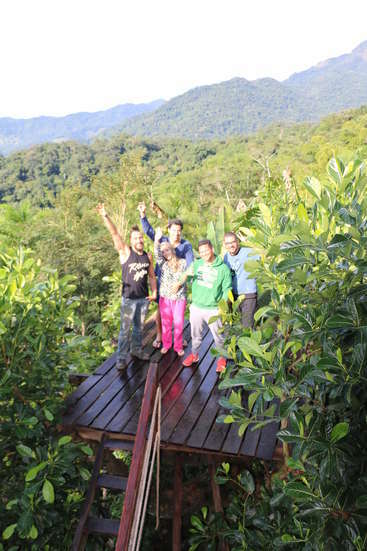 I shared a bamboo hut with another volunteer, and we had such a great time here together - we even joined a few tours to visit the local attractions, and I had rented a motorbike for a few days from the city to also do some sightseeing in the area of my own. It is a beautiful, tranquil place by the river, with elephants roaming about throughout the entire day. All in all, it was an incredible workaway experience and I thank Alexa and Bay so much for their hospitality and for making me feel like I was a part of the Chai Lai family. The staff and I built long-lasting friendships and for this reason, I would love to return and teach English to them again! I hope to see everyone again soon! I came to this amazing place for 10 days, and this is one of the highlights of my life. Alexa and all family are super nice and has a BIG smile all the time! The organisation is really significant and it is so meaningful being part of it. I spent just over 2 weeks here for my first Workaway experience. I've never been so bummed to leave a place or a group of people. Alexa brought me in and immediately made me feel like family. Outside of the actual volunteering, I loved how I was invited along for adventures and encouraged to get out and actually experience all that the area has to… read more offer. You will not find more welcoming, kind, and genuine people on earth than the staff. I can't praise this place and it's people enough. I hope I'm lucky enough to come back very soon! Michelle is a considerate guest and hardworking volunteer. We actually already invited her back a second time because we enjoyed having her so much. Very lucky and thankful for her help. A wonderful, life changing experience! The orchid is a beautiful place not only because of the grounds, but also because of the people (and elephants) that are part of it. This was my first workaway experience - I hope my future experiences are even half as amazing as this one was. This is the greatest experience! First I came here because I just want to learn about elephantes but I got a lot of thing more than that! All staff are friendly, we had a really good time together, Mahouts are nice and elephantes are awesome and cute (Thank you Tangmo and Chailai!) Karen, Burmese and even the guest make me see the world… read more differently. Alexa is really hardworking, kindness and strong women. You will exactly love her as I do. This is not a workaway but this is a family! Miss you all already. Thank you so much Alexa. Myrte was such an amazing addition to our team for the time she was here. She took initiative and accomplished more in her two weeks than others have completed in months. We would love to have her back and we wish you the best of luck, Myrte. Thank you for all your help! This was probably the highlight of my travels through South East Asia so far. I really respect Alexa and everyone else working at the eco lodge. They're working so hard to give the elephants from the neighboring camp a better life while also doing so much for the local community. It's incredible and I'm very grateful for being able to contribute… read more to a great cause! I hope I will be able to come back to help some more :) Thank you Alexa and everyone else for an unforgettable experience! We had the best time here ! Alexa and Allie were so welcoming and we felt part of the family, In fact all of the staff that work here are so lovely and we had so much fun exploring the Jungle and spending time with the Elephants. Alexa and Allie are very hard working and really passionate about helping the local communities, in particular the… read more Karen people. We highly recommend coming to volunteer here and i hope that one day we will come back to visit! We miss our bamboo home already! Thank you for everything. Awesome. This was our first work away experience. We did not know what to expect but it was over and beyond our expectations. You must be bubbly and outgoing. 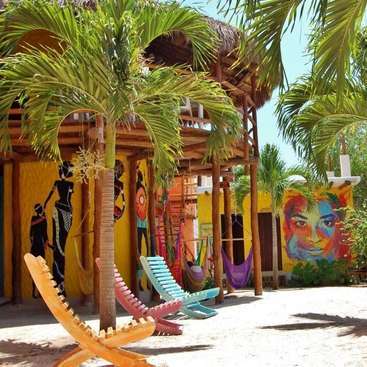 You need to be social and open to the fact that you are at an ecolodge with guests. You need to be self driven. If you possess even a little bit of these qualities, you will feel quite… read more at home here. The girls who work here are shy at first, so if you really make them realize that they shouldn't be embarrassed around you, they will really open up and you will have a very special relationship with them. Alexa is a busy woman. She cannot babysit or hold your hand. But if you get to know her, you will understand what a special woman she is and what she is trying to do. I hope Alexa liked us because she has friends for life here and aren't going away. And we will always support her cause and what she does. This place is like a magnet; I met many people who went there as visitors and ended up being long-term friends and volunteers. 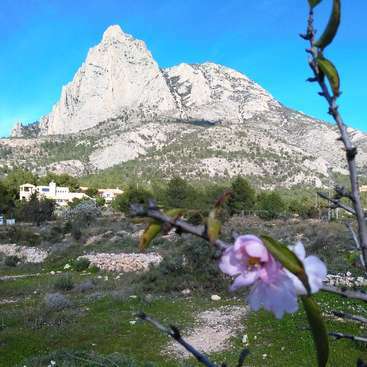 The ecolodge is a great place to live and enjoy amazing activities. 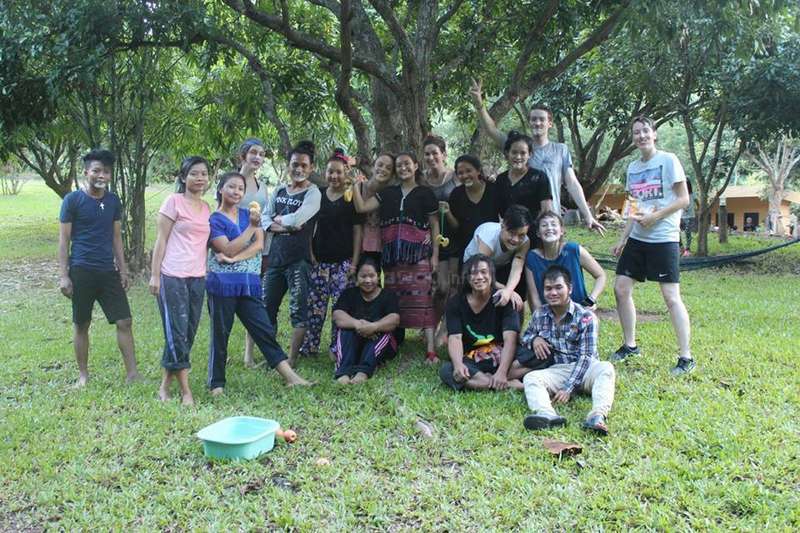 Moreover, Alexa, Gaynor, the Burmese refugee women/girls and the other volunteers are amazing people to hang out with. The most important thing,… read more though, is to understand the case the business is supporting. That's what encourages you to do more to support it with all you have. On my 3-month journey, this experience has certainly be the highlight. Not only do you get to see and play with beautiful elephants, you work to improve the lives of others. Alexa is brilliant, generous, and a perfect ambassador for the cause. I would recommend this place to anyone, and will definitely return in the near future. Everyone is… read more friendly, accommodation is great, and I learned so much about Burmese culture and struggles in Thailand. THANK YOU ALEXA! A big thank you to Alexa and the rest of the Chai Lai family! Alex and I had spent 10 days - an unforgettable time! 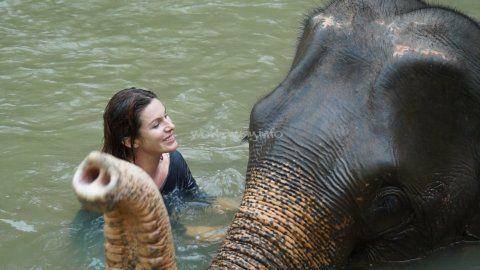 Living with the elephants, mahouts and lovely karen/kayan girls was a special experience. The combination of two great projects, is truly unique. We wish you all the best for the future - you should be very… read more proud of what you have established! Kathryn and Becky came here to volunteer Immediately we could tell that their presence here was to help as much as they can. They were each assigned individual tasks and accomplished them to the best of their abilities. During their stay one of our staff members was injured in a scooter accident and I had to stay in town at the hospital several… read more days. Becky was a lifesaver and basically managed all the customer service of the guest house for me. It was great to have someone so trust worthy and diligent here at that time. Kathryn taught English during her stay. Every day she would type up a curriculum for class of activities and lessons for the students. She was incredibly interactive, friendly, and encouraging to the students. It was also clear that the students really enjoyed and felt comfortable in her company, during class they could be heard giggling and quickly participating in the lessons. Before she left she was even kind enough to type up notes of the girl’s progression and the different activities and lessons she found to work best. 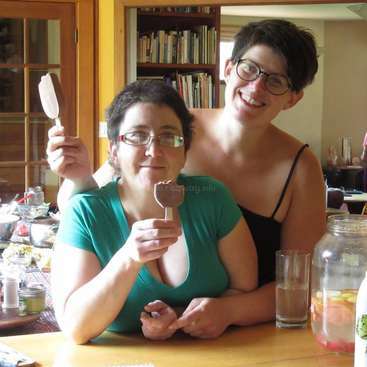 In addition to these set tasks, Kathryn and Becky were always more than happy to help with whatever needed to be done. Both women exhibit initiative, a helpful nature, and a genuine interest in the communities we work with. In addition to these things, they were extremely easy to get along with and a pleasure to be around. We are so happy they were able to spend as much time with us as they did and would welcome them back with out hesitation. WOW, what a fantastic host! Becky and I arrived here and were planning on originally staying for one week, which was extended to two and a half weeks, which is now being extended further and we are still here. We have the utmost respect for the director, Alexa, and her model of social and sustainable business. The organisation proceeds support… read more a program that empowers women at-risk for human trafficking. This includes English lessons, education on human rights and women's health, paid vocational and skills training, and then assistance with job placement in the hospitality industry to support themselves. If that wasn't enough, they have a range of side projects running simultaneously, such as supporting local Karen girls' college education, creating, distributing, and educating women with clean birth kits, supplying clean water filtration systems to local village families, creating a mobile health clinic, raising funds to support an elephant retirement farm, collecting warm clothing for families in the winter months, and sponsoring mothers. So we really hope people do not come here for a free ride, but serious about contributing to some very needed services. From our experience here, we think that volunteers who are self-starters and able to take initiation without much direction will do best. If you want or require a set schedule and step-by-step instructions how to do tasks, then you may struggle a bit in the beginning. With that being said, the coordinators here have a lot of faith in their volunteers, will never give you anything you can't handle, and are more than happy to offer support if you ask. Some things we did while we were here included: buying and planting an herb garden and water lilies for the pond, taking inventory of medical supplies, creating a drink menu for the cafe, making a price system for the shop, teaching daily English classes, and washing dishes. They are open to projects and ideas that you may create. Often they need people with more specialized skills such as experienced ESL teachers, graphic designers, and grant writers. Volunteers can either have a hut on the property or there is a volunteer house a ten minute walk down the street. The volunteer house has three bathrooms with squat toilets and showers, though there are western style toilets on the property. The house was clean and each person had their own bed and mosquito net. Volunteers are given three VERY delicious meals a day and free water. You must pay for your own drinks and any activities you join (bamboo rafting, elephant riding, treks, zipline, etc.) but you do get the special volunteer discount. What we loved most about being here though was being close to nature and of course, the people! We loved being able to hike in the jungle, be near the mountains, and meet the elephants. Mae Wang is an hour outside of Chiang Mai, so a lot of free time is spent relaxing, reading, hanging out with other volunteers, etc. But most of all, we loved all of the amazing volunteers, staff, and mahouts we became friends with. The nightly bonfires (and often beers) were lots of fun and will always be a great memory. A big THANK YOU to Alexa and everyone there for this amazing experience; we hope we gave back as much as we received. Best of luck with your projects, don't work yourself too hard Alexa, and we hope our paths cross again in the future! Volunteering here has been a unique experience personally and professionally. I stayed for seven weeks, time enough to realize the big impact of this project, the social work involved, so many people are being helped to have one chance, a hope for the future. I have been doing photo and graphic design (brochures, pdf's, web contents…) for the… read more resort and the activities… and also for the social projects. Being here is very intensive, the everyday life also involves different kind of activities, a real team work... the staff, the mahouts, the manager… people that I will never forget, and people that I hope to see again.